I think this will be one of the biggest in the neighborhood and given the architect, Frank G Neely Design Associates, it may be one of the best. It was built in 1952, 2,174 square feet on 0.5455 acres. I always liked it, even the hex window, a bunch of downspouts though. They don't do giant metal windows like this anymore, but "they" still do giant metal windows. It's at the top of the hill. It's not such a big hill but the house will command the street. It closer to the street than it appears in the picture. The house on the left, another former rancher, has already been done, including a recent upgrade by William T. Baker. New house, 3,100 square feet on 1/10 acre, must "match" 10 other 90+ year old 900 square foot houses in historic neighborhood. Architectural design for the project was by Ute Banse of Ute Design. Inman Park: "Atlanta's first suburb circa 1890" "Atlanta's first intown neighborhood to gentrify ... Gentrification began in 1969..."
Inman Park was a short lived home of the gentry. In New Urbanism terms: Inman Park got "leap-frogged." Druid Hills became the place to be. 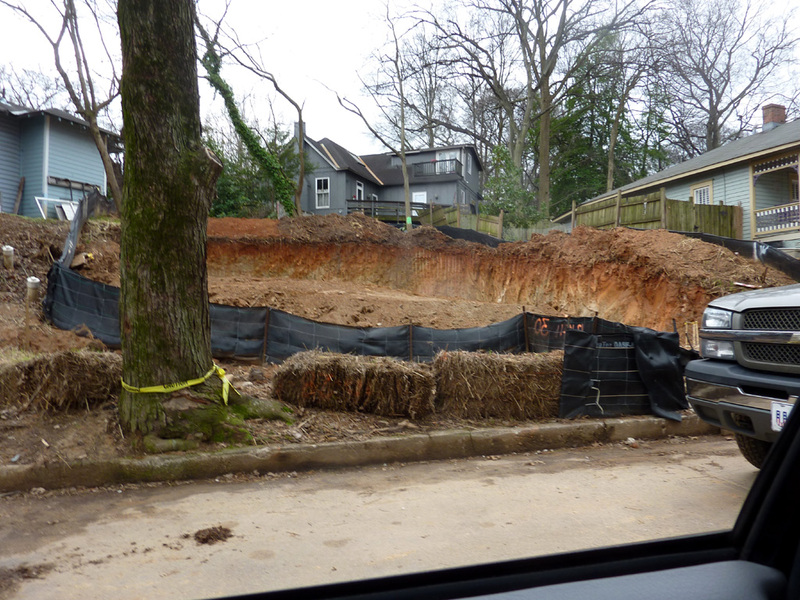 I'm sure Inman Park lost much in the process. But I'm not so unhappy about it. 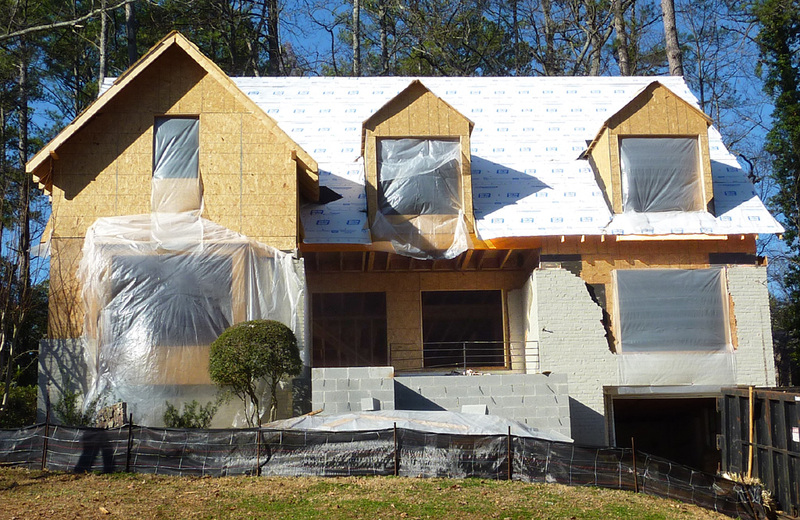 Druid Hills became a museum of beautiful homes, frozen in place. Inman Park became eclectic and colorful. Today it houses millionaires and poor students, families, hipsters, and hipster families. The last thing I'd expect is a vacant lot. This is not a teardown, not a burn down. It was the backyard of the house on the corner. This was the back yard of the blue house. How do you build 3,100 square feet on a 10th of an acre? Excavate the entire lot. Does this look a new home in a high prestige neighborhood? I admire this tiny detail, the lintels that project just a bit. Our new house makes 11 in a row. You can see 3 of them to the right. Perhaps the new house is a tiny bit taller. I'm amused that the new porch is on the right side of the house. All 10 old porches are on the left. It's probably because of the slope. Agree or disagree, I welcome your comments. Teardown 3 of 4, Can a 4-Square Go Anywhere? It was a Morningside post-war minimal traditional, about 1,376 square feet, on 1/5 acre, built in 1947. Thrive Homes built a new 3,000 square foot "4-square" in it's place. This defines post-war Morningside style. The house on the right was "done" with bump-outs and pop-tops about 1988. The house on the left has been "done" too, I suspect a pop-top and big windows, probably very cool on the backside. Here we go. 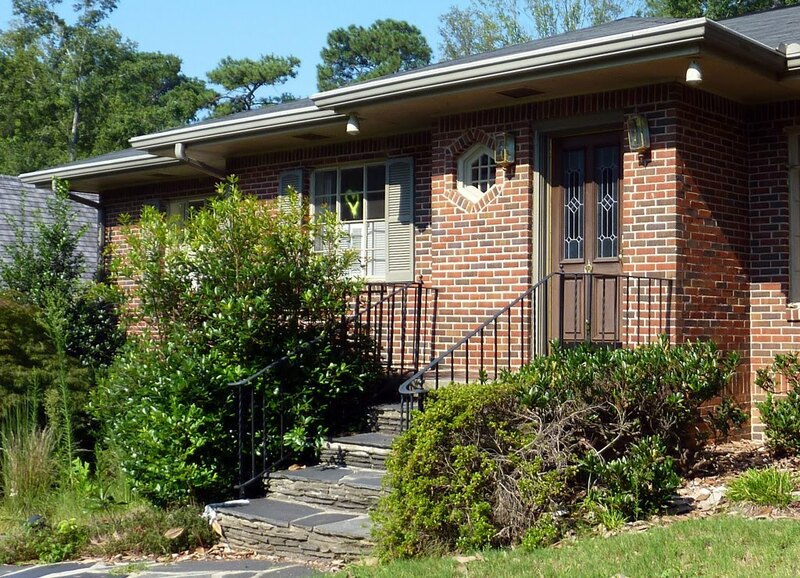 It isn't exactly Morningside style, but it is a Virginia-Highland style, and certainly a familiar American style. We wouldn't be surprised to see a house like this anywhere in the US, rural or urban. My impression is that this house could have been here before there was a neighborhood. It's as if the neighborhood was built around it. A European style house can't quite do that however beautiful, however old. 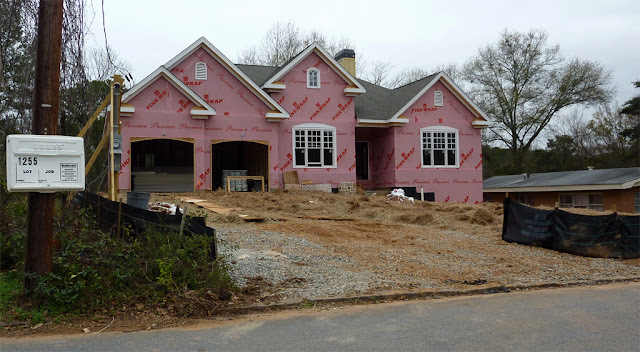 It's a good bet for spec houses and for custom/semi custom house, a good bet for design/build firms. You start with proven shapes and proportions, fit it to the lot, then tweak the size, materials, and detailing. I particularly like how it sits on the lot. It's welcoming, you can get out of the rain, you don't have to hike up a hill. It's passes my grandma test: would you send granny to the mailbox? Wherever you think about teardowns, this one is better than most. I think the designer/builder has to be very good to do poptops. It takes a lot of experience to manage the design/budget/market tradeoffs. John Willis Custom Homes did this one. I think they do them as well or better than anyone in town and they really know this neighborhood. They could have torn it down and rebuilt from scratch. Perhaps they would have in 2006. It was a 1948 rancher on 1/4 acre, about 1,600 square feet. Notice the recessed porch? Will they keep it? Here it is in context. It sits on the bluff side of the South Fork of Peachtree Creek. They might be able to see the creek in winter from the new second floor. The house on the right has already be done It is a colossal improvement over the house it replaced with it's hexagonal picture window. You must have tall ceilings these days. So you tear off the roof AND the ceiling joists. Then you build a knee wall, maybe 2 feet taller and a new joist system fit for a 2nd floor. They kept as much brick as they could. They've got a bit more landscaping to do. It's the one on the left. It's blends rather than shouts. They kept the recessed porch and built massive front steps. I don't think this top dead center picture is it's most flattering angle. 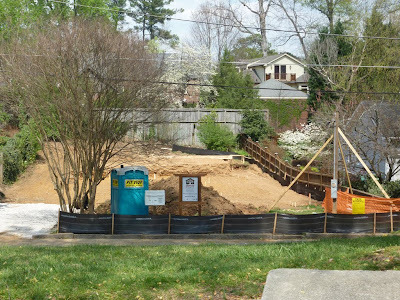 The landscaping awaits a budget infusion to soften up the stairs and porch. "stucco, Voysey & gables galore"
Next: 3 of 4 is a teardown where style matters. Biltmore Acres is not a prime destination for architecture tourists. Few neighborhoods are. By and large the Toco Hills / Briar Vista neighborhoods were built out in the 1950's, mostly ranchers on 1/4 acre lots. Convenience to nearly everything in Atlanta: Emory, Georgia Tech, Buckhead, interstates, transit, downtown, shopping, and all the hospitals make it a terrific value. But it's not full of 80 year old bungalow charm. It's a good place for a teardown but not a place for architect designed teardowns. It had 3 bedrooms 2 baths, about 1300 square feet. The Devoted Classicist made a point that sticks with me: "The relationship to the finished grade..." I don't think that relationship is very successful here. It reminded me of something that Holly from Things That Inspire told me. She and Stan Dixon.(D. Stanley Dixon Architect) were cruising Buckhead houses. Stan said that you had to design with the landscape so that the house didn't appear to be falling off the hill. I think that's an issue here. Perhaps the landscaping will make all the difference. So many tear-downs are complete. I'll show y'all the "afters" later. Number 1: I don't know the age or square footage. I don't want to know, but nice lot at 0.26 acres. It was probably very likeable in it's day. It's on a street that is not flattering to its houses. Know what I mean? I won't miss this at all. But the "after" isn't my favorite either. A classic in neglected landscape. The house to the left had already been done. Number 2: 1948'er with 1,600+ square feet on about 1/4 acre. It's on a little hill. In context. The house on the right had already been done. Number 3's replacement is the biggest and fanciest, I think. Acres 0.2066, year built 1947, living area 1,376 square feet. Let's hope they saved Santa. House 4 is an infill and must be the smallest new house in in-town Atlanta. Folks carved 0.0872 acre from an exiting lot and made it work, somehow. This is a neighbor. The new infill plays well with this one. Most Atlanta architecture tourists know this charming one-block street. I'll show the the afters later. It's a beautiful little apartment building on Frederica near the library, one of many such in the neighborhood. They didn't do this level of detail after the Depression, not in small apartments. 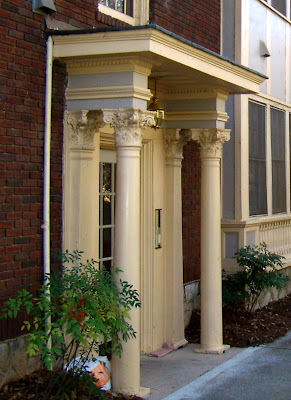 You have walk or stop your car in the right place to see these little porticos. It's narrow and deep. The lot is only 60' wide. The facade only 31 feet. The entrances are on one side, an alley on the other. I look for excuses to go this way. Folks build these forms, shapes, and proportions today. But they "abstract out" the detailing and the related expense. Let's hope this one has modern fire protection. So what about that Whatchamacallit? I know you should put your decorative money where it shows. You have to go down the alley side to see this.